David Hepworth's blog: How did anyone survive bonfire night in the 1950s? 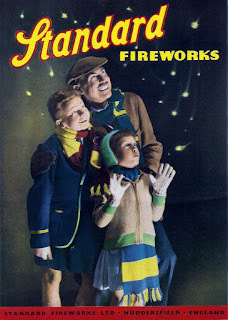 How did anyone survive bonfire night in the 1950s? Our house was on an unmade road that finished in a farmer's field. Every year we built a bonfire in that field. For a few Saturdays beforehand we would go "chumping". This meant finding anything combustible we could beg or steal and dragging it to the site where our fathers would build it into some kind of structure. Parental supervision was patchy. We kids would wander up there with a bag full of fireworks and a box of matches long before the adults appeared with the parkin and brandy snaps. I can see the kid now. He was ten years old and he carried his stash of fireworks in a leather school satchel strapped across his chest, evacuee-style. Somehow a spark must have got in there because there was a commotion and I turned to see this lad desperately trying to divest himself of the bag, from which flame was now shooting in every direction. Somebody's dad got to him, pulled the strap over his head, threw the sorry-looking satchel to the ground and stamped on it. He was OK. It didn't interrupt proceedings. His gabardine school mac was ruined, though. Bet he caught hell from his mother. Mischief Night always preceded Bonfire Night, of course. We used to wrap sellotape round the bangers for extra percussive effect. Then we'd throw them into the Gents in the yard of the local pub. Great fun for us, but probably not for the drinkers. Some time in the early 80s I was delegated to go and buy the fireworks for the babysitting circle. Acting on a tipoff I went to a council tower block in Swiss Cottage where lurked a man who sold cheap fireworks. On the 11th floor. I was shown into a room filled from floor to ceiling with heaps of fireworks of all sorts, some the size of mortar shells. I handed over my ten quid for a child-friendly selection and got out of there, fast. I didn't even take the lift, I walked down the stairs. I was expecting to read about the whole place going up, but it never did. We built our bonny on the concrete aprons left behind when the post-war asbestos prefabs, next to our council estate*,were razed. We would start building it at least week before November 5th which meant that someone had to guard it against firebugs. So a couple of us would 'camp' inside the bonfire which wasn't so bad as there was usually a mattress in there somewhere. Novembers must have been warmer then. I remember someone saying that every year kids get burned alive because while they were kipping someone set alight to the tempting pile but it didn't stop us doing it: thanks mum and dad!.Did that really happen? I've not heard anything during the forty years since. Then again, public, collective social life is so regimented now. * Council estates too have gone to, it seems, to be replaced by 'social housing'. To take up Larry's point; to a ten year old me, a banger was as a stick of dynamite to Wylie E Coyote. I never trusted them. "Sir, you need to get back".